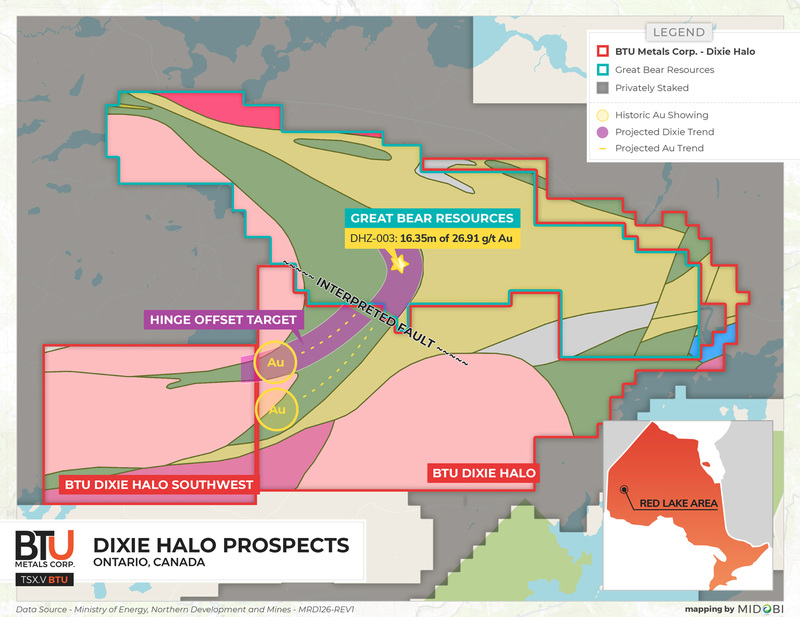 November 23, 2018, Red Lake, ON, Canada – BTU METALS CORP. (“BTU” or the “Company”) (BTU-TSXV) is pleased to announce that it will acquire an additional 4,163 hectares of prospective and geographically targeted mineral claims in the emerging Dixie discovery area of Red Lake through the acquisition of Burgundy Exploration Corp. (the “Burgundy Acquisition”). “Thanks to our geological and geophysical teams, I believe we are in a unique position of adding to GBR's district success of building a new and exciting gold district. It now appears that with our new hinge-offset geological and geophysical model, we could be looking at extending on GBR's 10 km Dixie structure by an additional 10 kms owing to our new acquisition. We view today’s acquisition of further greenstone exposure as significant for our shareholders, especially given a newly revealed gold showing identified by our company’s recent data compilation and digitization efforts,” noted Mr. Doug Hunter, Director of the Company. Under the terms of the transaction, the Company will acquire 100% of the shares of Burgundy Exploration Corp., from arm’s-length vendors, in exchange for 3.6 million shares, 1.8 million shares which are to be issued upon closing and 1.8 million to be issued on the first anniversary of closing. A pre-existing 2% GSR is applicable on the tenure being acquired under the Burgundy Acquisition. There are no cash payments associated with the Burgundy Acquisition nor is there any mandated work expenditures outside normal government assessment reporting obligations, which are next due on the newly acquired property in the second-half of 2020. Closing of the transaction is subject to TSXV approval. No finder’s fees are payable. 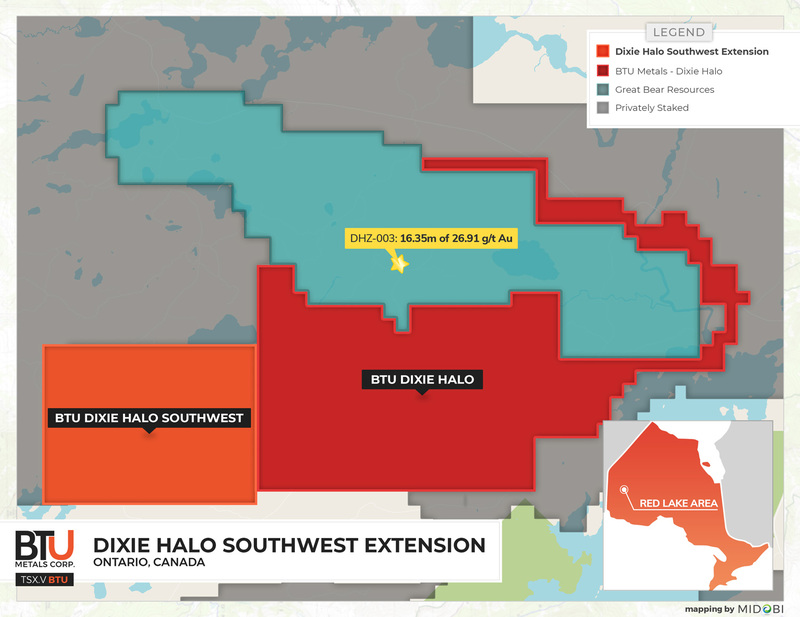 The additional mineral claims to be acquired through the Burgundy Acquisition will be referred to as the Dixie Halo Southwest Extension (see maps associated with this news release), and furthers the “hinge-offset” exploration model developed by BTU Metals by an additional 5 km to the SW. The Company’s exploration team is currently being guided by results from the Fugro HELITEM airborne electromagnetic (EM) and magnetics survey on Dixie Halo that highlights an interpreted fault around which a “hinge offset” to the south and then west on the Company’s properties appears. 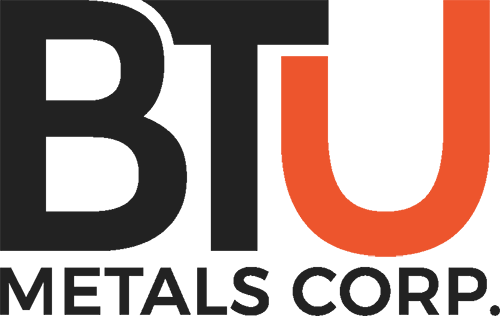 The Company is also pleased to announce that Mr. Alan King has been retained to further analyze the Fugro report in order to identify new trends and targets. This will be supplemented by work results which have revealed three areas of gold showings that will be followed up on. Among other experience, Mr. King has held posts as Manager of Geophysics at Teck Cominco with responsibility for global exploration as well as Chief Geophysicist for Vale Global Exploration working on geophysical applications as well as target generation using regional and global data sets. Submission of samples to lab with assays pending. *Mineralization hosted on adjacent properties is not necessarily indicative of the mineralization hosted on the Company’s properties. The technical contents of this release were approved by Douglas Hunter, P.Geo-QP, as defined by National Instrument 43-101. The property has not been the subject of a National Instrument 43-101 report, and Mr. Hunter has not verified the technical data disclosed in this release due to the historic nature of reports quoted.